A new author always faces a Sisyphean task ahead in his/her first book: to be original, to offer something new, in short: tell me something I don´t know. Not an easy feat. Even so, now and then someone appears who manages to shake the core of our cynical belief that maintains there’s no such thing as an original approach in short fiction—which is something that, I suspect, is almost true, as if we were rapidly approaching a kind of Omega Point for short stories that will soon render them completely dull, predictable, and forgettable . . . but that’s another story entirely. 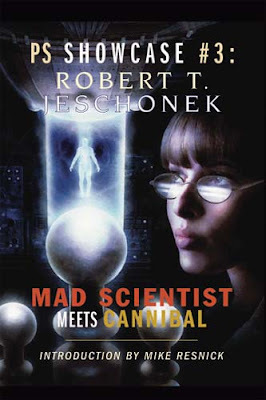 For Resnick, Lafferty and Jeschonek are pretty much alike “because nobody sees the world quite the way Robert T. Jeschonek does.” And that’s exactly how the five stories in this collection made this reviewer feel: like seeing things for the first time. Back home, we had a tradition: the worse the weddin’, the better the marriage. That’s why our people worked so hard to ruin each other’s weddin’ days. This is a family of hillbillies (or genebillies, as they call themselves) who revel in wrecking each other’s weddings. Thing is, they are post-human, and master the realm of nanotechnology. So they release a new “world-eatin’ bacteria” and things go haywire, but far more than they are expected to go. Before they are consumed by the bacteria, her brothers tell her she will be the last person in the world, except there won’t be a world, but they are pretty sure she can create a new one. But can she? The second story, “Dionysus Dying”, is a beautiful tribute to an old, dying jazzman who wants his biggest follower to be “his breath”. Bobby is called by the famous Omar Wild to record his last album for him, because Wild will never get to do it: he’s dying of cancer. To record Revelations, however, Bobby will have to play the sole Wild album he loathed so much he can’t even bring himself to listen to it—an experimental piece of the 70s called Nyneveh. But Wild won’t have it any other way. Bobby, who has drinking and anger management problems, doesn’t like to be bossed around, and sometimes he feels like letting the old man die without helping him. But things aren’t that easy (are they ever? ): the temptation is just too much for him, and he ends up accepting it, even if that means much hard work . . . and possibly trouble. For instance, the ‘Solomon’ solo is forty-five minutes long, and it’s entirely freestyle, random. “About the only way to play it is to memorize every note”, a befuddled, angry Bobby explains to Wild. Except for one thing: not everything in this solo (or in the album, for that matter) is random. There is a pattern. “A code, a key to open things,” as Wild tell him. And Bobby will need to unlock the code in Nyneveh to get what he wants—but the code may also be a burden, because, among other things, it makes the player have visions of past things, and things to come. Bobby will be hard pressed to help Omar Wild´s caretaker, a former jazz singer who fell from grace and has her life threatened. And he may not be the best man in the world to play the role of savior. “Dionysus Dying” remembers in a vague way Julio Cortazar’s novella “El Perseguidor”; like the Argentinian author, whose passion for jazz led him to pay a marvelous homage to Charlie Parker in that story, “Dionysus Dying” also talks of jazz, in its convoluted, apparently random ways. But the randomness is just a smoke curtain because, like Cortazar, Jeschonek guides us on a downward spiral, although his prose is much more straightforward than the convoluted narrative Cortazar concocts. And it’s good, because both stories have very different goals in the end. A weird story in the old-fashioned way, “Dionysus Dying” is Jeschonek’s “Shape of jazz to come”—even though the ending, beautiful as it is, disappointed me a bit. Too much sturm und drang in the beginning to end with a whimper. But maybe that’s an all-too-real metaphor for Bobby’s state of mind throughout the story. “Food Chains” is a story of space exploration and of what happens to a crew of a crashed ship in a desert planet. But it’s a delightful romp. For starters, the spaceship is called Puerco (Spanish for Pig), for crying out loud! And it’s all about food, of course: their mission is going to the forlorn planet Polvo, “dust bowl of the galaxy” (which makes sense, because “Polvo” means “dust” in Spanish), final resting place of two of the protagonist’s brothers. And maybe her third brother as well, who had disappeared a month earlier on that planet, and who might have fallen prey to a man-eater. But she’s in for a surprise when she gets there—if she gets there, because the ship crashes on landing, and they must survive first in this desert planet. The element of estrangement is in the Rations they eat—the Rations are living; they are humanoid, but apparently not human, and are genetically engineered so that they can willingly, among other things, roast part of their bodies and give them to be eaten—which reminded me of Li´l Abner´s Shmoos. Rations can use their body chemistry to prepare their own flesh to the taste of the eater, regenerating every bite taken out. And they are created to be quite happy to do so. But she has issues with Rations—because they are not only genetically engineered to be nutritious. If the wrong person eats it, he/she can die if the Ration is attuned only to the DNA code of the original user. That’s what happened with her two brothers Miguel and Oswaldo when they were children. Everything goes wrong in the mission, of course, and she is forced to eat the Ration (a man-shaped humanoid called Manny), but she does it because it’s the only way she can survive to find her last brother—and has a big surprise when she does (which won’t be the last surprise, by the way). The ending is predictable, but well written—and it’s about hunger and love, things with which we can all relate to. “The Day After They Rounded Up Everyone Who Could Love Unconditionally” is a story that requires a certain amount of balls to write: today it’s very hard to write really original short short stories (or flash fiction, as they’re being called these days). Nobody did it like Fredric Brown, as Mike Resnick points out very well in the preface. The story is told in first-person by a guy who stayed back. After all, “so few people were taken. Not much disruption at all,” he thinks to himself. The people Who Could Love Unconditionally were simply asked to leave, and life got so much easier for those who stayed. Or has it? After all, he finds that he misses his loved one. This is a short, well-rounded, and sad story. And Robert also managed to write a good last surprise sentence (one of the reasons why I wrote about the balls up there). Arguably the best story of the collection, and one of the best flash fiction stories I’ve ever read. And that’s not the only problem poor Glue has to face. Not when the mad scientist community is being prejudiced. After all, in the good old days, mad scientists weren’t considered public enemies, but not since the terrorists. Naturally, the main goal of a mad scientist is to conquer the world, or to destroy it. Hildegarde Medici has just finished the construction of a doomsday weapon, which she fully intends to use—if she has the time to do it, because, when all is settled, she finds out that she has cancer. NOTE: A different version of this review appeared on The Fix.